Saul Williams Presents "Chorus: A Literary Mix-Tape"
The Book Cellar is proud to host Saul Willams during his Chorus Spoken Word Tour. Incorporating elements of poetry, music, and performance in his work, Williams is a dynamic artist who defies any one categorization. He is the recipient of the Cannes Film Festival's Camera D'Or and Sundance Film Festival's Grandy Jury Prize. Join us at 5:30 p.m. to watch him perform before he takes the stage at Schubas Tavern later in the evening! 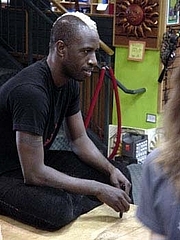 Saul Stacey Williams is an American poet, writer, actor and musician known for his blend of poetry and alternative hip hop and for his leading role in the 1998 independent film Slam. Saul Williams is currently considered a "single author." If one or more works are by a distinct, homonymous authors, go ahead and split the author. Saul Williams is composed of 2 names. You can examine and separate out names.